Approximately 160,000 people are members of the Grange Organization as a whole, in 2,100 communities nationwide. In the State of Connecticut, there are over 40 communites with a Community (Subordinate / Local) Grange. 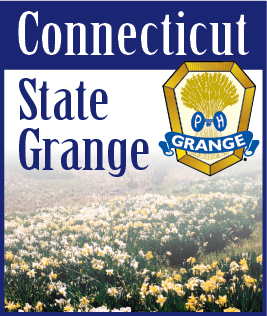 The Grange is a unique, fun-loving yet hard-working group, which is dedicated to community service, legislative advancements, and personal development. As one of the oldest organizations in the United States, the Grange means different things to different people, with the common thread of camaraderie and a sense of contributing to something much larger than oneself. Grange membership is non-exclusive. Members are not limited by age, gender, culture, race or faith. In the ever changing community, the Granges across the State of Connecticut provide diverse services. Our organization is comprised of all types of individuals - including men and women of all ages, from trades people and small business owners to educators and professionals. Since 1867, Grange members have been meeting the needs of their communities and the nation. Our organization has constantly evolved to be of service to our communities, families and our neighbors. It is important to note that the Grange's interest in legislative action is what sets it apart from other organizations. Since its inception, the Grange has been involved with the legislative aspects of our society -- from a strictly non-partisan position -- as one of its distinctive characteristics. All policies which the Grange advocates on the local, state and national levels are initially voted on by its membership. Historically, Grange policy reflected the predominantly rural and small-town composition of its membership and therefore dealt with topics of concern to those people: such as rural quality of life issues, farm programs, rural economic development, environmental and consumer issues, and similar topics. But the Grange has changed along with the times. Today's issues include such topics as urban and suburban life, taxation, transportation, business, education, and more - alongside of the issues affecting rural life and farming in the 21st Century.